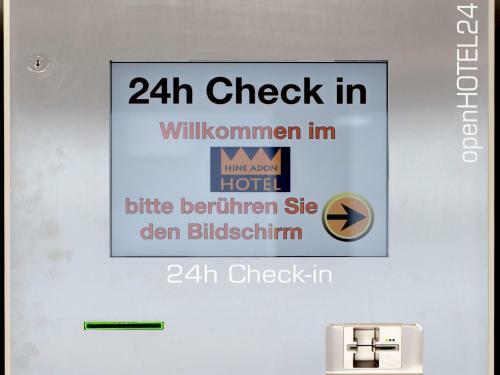 This a unmanned hotel, meaning everything is done by entering codes etc. I don't really like these kind of hotels, but that's just an opinion. The cool part is that it all (well, most of it) works fine Being a bit old fashioned, I called the available telephone number and was excellently helped by one of the Hine Adon people, also at 22:30 ! The room we had (on the top floor) was spacious, clean and equiped like an appartment. The very big balcony gives view to the quiet Belp railway station. Very cool room. Location is near the train station. Everything was clean and nice. There is a pizza near hotel. Will stay here next time for sure! This is self check in hotel if you check in after 6:00pm. You may check your email or text message before you come. You need a code for check in. The lobby is simaple but the room is superised me, how big and modern. The new and nice hotel! Location is little hard to find, far away from freeway! Excellent Hotel, very comfortable and spacious, the staff was wonderful, we were very pleased with our stayed at the hotel, they Even provide the room with kitchenette. We have been visiting Switzerland with my family many time moving from hotel to other. You may not believe if I tell you this hotel is the best, for many reasons, first the hotel is quite new with modern furniture. Second, the price of hotel accommodation is so cheap comparing to the prices throughout the country. The train is just in front of the hotel. Ben is 15 min by train. Interlaken is 1 hour from the hotel. I would certainly come back to the hotel if I have chance to visit my lovely country Switzerland. It’s close to the rail station. Still quiet, beautiful view from our terrace apartment. It is great having a kitchen. Everything was way above our expectations. The Cleanliness and Simplicity at Reception for checking in and out. The Location was ideal for our requirements. Would throughly recommend to family and friends. Excellent location and very comfortable..very good staff and excellent system. The room was big and clean enough. especially I liked the shower. 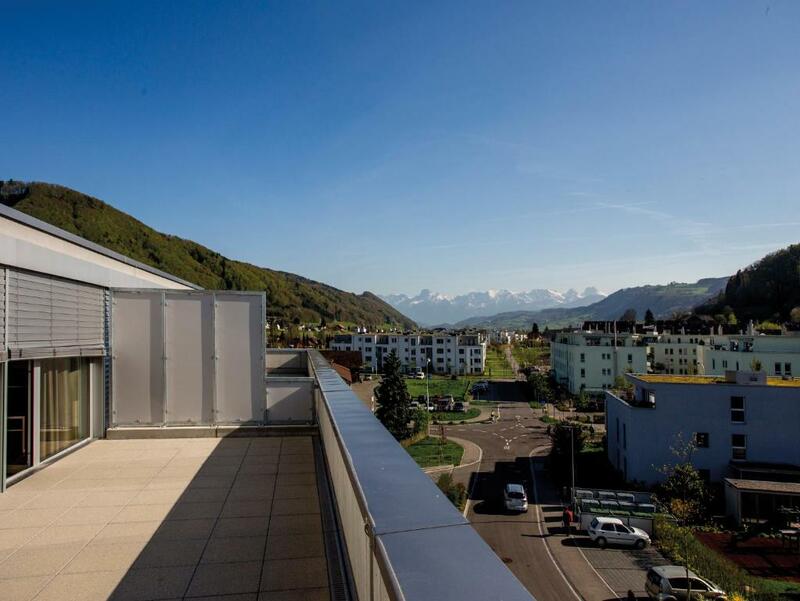 Lock in a great price for Hine Adon Bern Airport – rated 8.5 by recent guests! 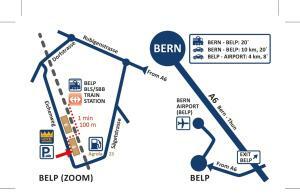 Newly built in 2015, Hine Adon Bern Airport is 650 feet from Belp Train Station and a 15-minute train ride from Bern’s city center. Bern Airport can be reached in a 7-minute drive by car. Free WiFi is available. It offers you modern apartments with a kitchenette. Couples in particular like the location – they rated it 8.4 for a two-person trip. This property is also rated for the best value in Belp! Guests are getting more for their money when compared to other properties in this city. Good for couples – they rated the facilities 8.7 for two-person stays. When would you like to stay at Hine Adon Bern Airport? This apartment features a kitchenette. Please note that the windows cannot be opened. Please inform the property in advance if you would like to use the apartment´s kitchenette. You can use the Special Requests box during booking or contact the property after booking. Private parking is available on site (reservation is needed) and costs CHF 15 per day. This apartment has a stovetop and kitchenware. This apartment features a balcony, cable TV and dining area. House Rules Hine Adon Bern Airport takes special requests – add in the next step! All children under 2 years are charged CHF 20 per night in a crib. All children under 16 years are charged CHF 35 per night for extra beds. Any additional older children or adults are charged CHF 35 per night for extra beds. Hine Adon Bern Airport accepts these cards and reserves the right to temporarily hold an amount prior to arrival. Please note that an automated check-in machine is available 24 hours a day. Your apartment will be ready as of 15:00 on the day of arrival. The hotel's hotline is available 24 hours a day. In order to provide you the entrance codes as well as a code for self-check-in terminal, the hotel needs your correct cell phone number. You will receive a text message from the hotel on the day of your arrival. Please inform the property in advance if you would like to use the apartment´s kitchenette. The use of the kitchenette is included in the rates. You can use the Special Requests box during booking or contact the property after booking. Please note that the property offers a take-away breakfast. This must be requested at least 1 day in advance. Everything was perfect - but really everything. Our kettle was broken. The shower curtain was ineffective and water got all over the bathroom floor. Spacious, comfortable, everything you could need. Good kitchen facilities in room. Staff were quick to respond to my queries over email and all the info was given to me clearly over text and email. I couldn't change the air conditioning temperature in my room. The rooms are big and they have everything you'll need. Considering the location, it was a bit on the higher side in terms of price. However, Switzerland is always expensive. We had a last min booking and we found it really awesome apartment. Well maintained, quite modern facilities and almost everything was perfect. Check-in was seamless, and completely automated. Amazing experience. Right next to the train station, if you are commuting by train. Nothing i can make out. Everything is just excellent. Please please don’t go anywhere else when u r near the Bern area. This place is absolutely value for money with state of the art intelligent apartments on offer. Location is fabulous , just beside the belp platform. Not even 20 mtrs from the platform end. Extra clean rooms and toilets. My best stay in this whole Europe trip undoubtably. Kitchen is fully equipped, so u can cook ur food as well. The nearest supermarket is just 100 mtrs on the other side of the platform. I really can't fault the Hotel at all, only thing I disliked was paying extra to put car in a very empty garage, I definitely think it should be included. Staff amazing especially the young receptionist exceptionally helpful. Hotel literally 100mtrs from the train station.